Tuesday, April 26th, 2016 at 4:46pm. Do you want to know whether you are the tortoise or the hare? 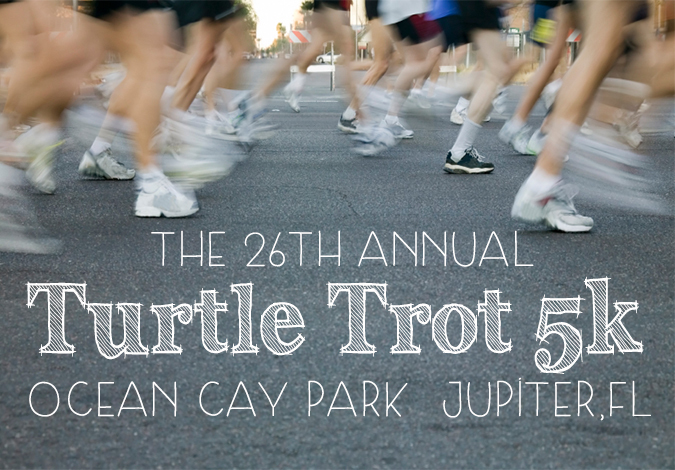 Give it your best shot with family and friends at the 26th Annual Turtle Trot 5K in Jupiter. The celebrated, annual Turtle Trot 5K Run put on by the Town of Jupiter is taking place on May 7th and the race starts at 7:30am. The Turtle Trot participants must check in at Ocean Cay Park in Jupiter. Details on the race are as follows: The main Turtle Trot is a “flat out, back and forth” 3.1 mile long race. The competitors will run along the beach road all competing for the first place title. But if you aren’t into racing flat out don’t worry, joggers and walkers are applauded to partake and completion is a celebrated title (both the tortoises and the hares are welcome here! ).